Perhaps we’d be better off conceiving them as less abstract, predictable and measurable, and more like unpredictable artistic creations... we then might feel less guilt when they become “e” and ask “y” did they turn out to be paradoxical tragi-comedies while expecting no ultimate answer. They're also geometrical and chemical in nature. Mix the X, while perusing upon Y, with the new (girlfriend) Z factor. And you can get a rather smokin' hot alchemically explosive moment in time. 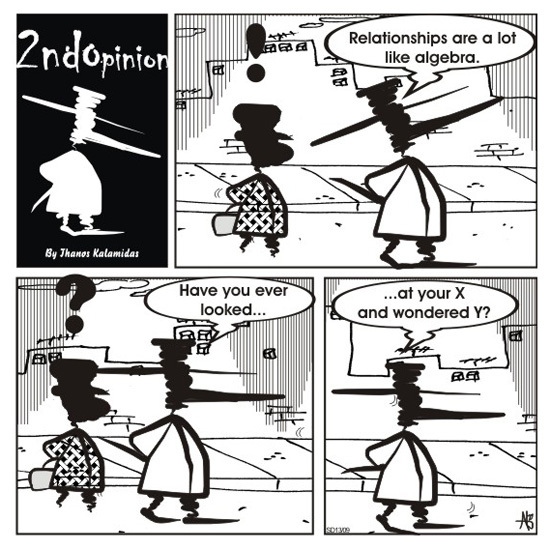 When X plus Z will uncomfortably answer your Y - Y part of your Life's Equation. The sad sad thing is that Asa and I know somebody who is just like this man!! !